Summary: What if your whole world was a lie? Let's just establish one thing right away here - I adored the first two books in this series. 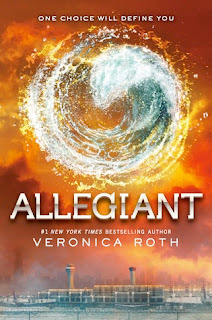 I felt that Divergent and Insurgent were well written entries into the dystopian, young adult genre, and I liked the plot elements that Veronica Roth explored, the idea of dividing society into segments based on their skills and weaknesses. So I was really looking forward to Allegiant and what it would do to conclude the series. Unfortunately, I was disappointed. Allegiant just felt as though a lot of the magic and the drive that fueled the first two books was gone - my attention wasn't grabbed by this book the way it was in the others, I wasn't glued to the page, barely able to put it down. Instead I found myself skimming, wanting to get to the more interesting bits. I don't consider this a spoiler, as it was announced well ahead of time and does not reveal anything about the plot - the POV in this book shifts back and forth between Tris and Tobias. When I heard this, I thought GREAT! It is always interesting to get into someone else's head! I always wished that there was a chance to do that in the Harry Potter series - that's one of the reason I love fanfic so much, it gets into things that the author doesn't touch on. Unfortunately, I didn't find the switch-up in the POVs to be particularly interesting, which is surprising. In fact I actually thought that it detracted from the book a bit, because Tobias' POV wasn't distinct enough from Tris. There were quite a few times in reading this book that I was surprised to realise I was reading Tris rather than Tobias, and vice versa. Worst of all, he didn't sound like the Tobias I had seen through Tris' eyes, and while there is always some disconnect between the way we see ourselves and the way others see us, I didn't find this as close as it should have been. 'What should have been' brings me to my last point about the book. Sadly, what could have been an incredibly fascinating journey into areas of this world that we haven't yet explored turned into a somewhat meandering story instead, with a lot of questions left unanswered. It's sad because the elements of a spine tingling, fascinating conclusion are in there, but they are fuzzy and jumbled and just not articulated well. Roth makes more than one decision that will be controversial, something I am not going to get into here, for the sake of spoilers. Ultimately I disagreed with several of her choices and did not close the book feeling satisfied in the journey or that all my questions were answered. As much as I hate to do this, I feel the book deserves the two star rating because it did not live up to its potential or my expectations.